What is the difference between Naturopathic Doctors and Homeopathic Doctors? Blend all dressing ingredients in a blender, adding mustard will give a creamy dressing that will not separate into oil and vinegar. Set aside. Add more Olive oil to thin the dressing if required. Drain and rinse canned beans, set aside in a sieve or colander to remove excess moisture. Cut green beans into one-inch lengths. Combine the rinsed canned beans and other raw ingredients in a container that can be tightly sealed. Chop mint with a very sharp knife so as not to bruise and add to bean mixture. Add the dressing and toss to combine. Allow salad to rest for 2hrs before serving. 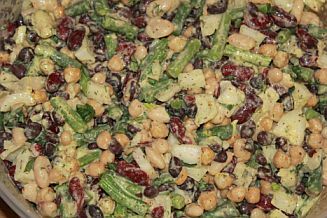 The salad will keep for several days in the refrigerator and improve in flavour. Wet vegetable options will reduce the keeping time; cucumbers and tomatoes for example can be added at serving time. Why are PROBIOTICS essential to good health? Adrenal Fatigue – Are you sick and tired of being sick and tired? What deodorant are you using? Skin Conditions: What organs/systems play a role in skin conditions? What’s a Bone Broth Fast and Why Should You Try One? Are all gluten-free products healthy? What’s the problem with chlorine in our drinking water? How does COFFEE affect my health? How much water should I be drinking? What is MSG and what is the problem with it? What cookware should I be using? How did I get a fungal infection? Is there a problem with soy? Is there any problems microwaving plastics? What are the effects of microwaving our foods on our health? Is there anything wrong with CORN? Is there anything wrong with ASPARTAME? What is the problem with PEANUTS? What is the problem with PORK? To detox or not to detox: that is the question? Are all natural supplements created equal? If I’m not consuming dairy, where do I get my calcium? What is the difference between wheat-free and gluten-free? What does it mean when food is labeled “organic” and is it actually better for you? What is the Problem with Cow’s Dairy? What’s wrong with WHEAT anyways? What is Bowen Therapy, also known as Bowen Technique?